Here’s a good snapshot of what’s happening in the 2016 presidential race by the poll numbers. A majority (51%) of Democrats seem to be favoring Hillary Clinton for the Democratic nomination. 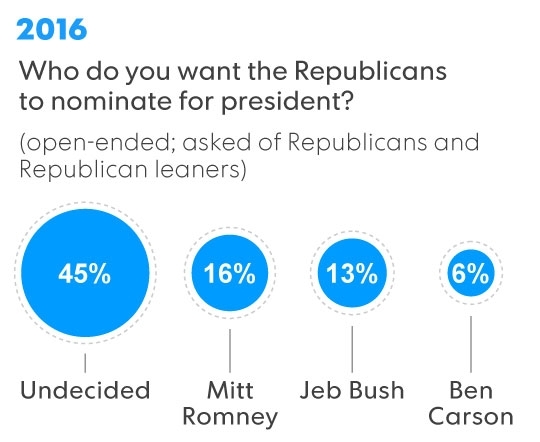 On the other side, a plurality (45%) of Republicans are simply “undecided” among the crowded field. To illustrate the backwards nature of the polling, USAToday put together this nice graphic. No wonder so many Republicans are considering a bid for president in 2016: It may be the most wide-open field ever. A new USA TODAY/Suffolk University Poll finds Republican and Republican-leaning voters scattered among 18 prospective nominees when asked an open-ended question about whom they want the GOP to nominate for president next year. “Undecided” finishes first, at 45%, trailed by 2012 nominee Mitt Romney at 16% and former Florida governor Jeb Bush at 13%. No one else gets close to double digits, though potential contenders including Texas Sen. Ted Cruz, Florida Sen. Marco Rubio, New Jersey Gov. Chris Christie and others make the list of those mentioned. The contrast couldn’t be sharper with the other side. 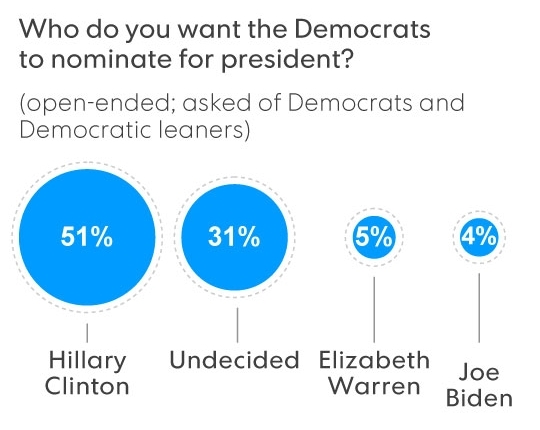 A 51% majority of Democratic and Democratic-leaning voters name former secretary of State Hillary Rodham Clinton as their preferred nominee; 31% are undecided. Just 5% name Massachusetts Sen. Elizabeth Warren, a favorite of progressive activists, and 4% Vice President Biden. As you can see, there is a large discrepancy between how the voting population is feeling about their options. This isn’t to say that Hillary has the nomination in hand, but her polling would look intimidating to anyone hoping to challenge her in the primary. Considering that Hillary is FULLY dedicated to running, and is fully expected to, it is ridiculous to have 49% NOT want her. I can’t find the poll wording, but I would expect Dems to say they want Hillary, unless someone better comes along. The fact that 49% of DEMS don’t seem to like her that much is a serious problem. I am not as surprised by the Pub side, since everybody’s being so coy, and it’s just chaos. But the name “Clinton” evokes love and hate. She’ll have a hard time garnering wide support beyond what is needed to secure the nomination. 51% is a little lower since she was up in the 60s. If Warren doesn’t run, you think Jim Webb can make a run? Maybe a Clinton/Webb ticket though I hear Tim Kaine is near the top also for the Virginia vote.. But I’m still not convinced she’ll get the nom. After all, she’s the ONLY obvious candidate, and yet, HALF of the party is, in effect, rejecting her. The only Dem than can win is Hillary – there’ll be no Dark Horses this time. It’s a shame B.O. destroyed the possibility of another black POTUS for decades – I believe Carson comes closer than any other GOP candidate in representing what a great majority of “The Grass Roots” & GOP want. While Christian, he will fly a secular flag. First, Hillary has a tin ear, like Willard. We already heard that she said she was “broke” when she left the White House, and that she was “under fire” in Bosnia. Today, I read in the Weekly Standard Newsletter that she spoke before the CAR DEALER association, and said she hasn’t been behind the wheel since 1996. It’s the kind of thing you don’t volunteer to that group. Even if true, you say, “the best kind of transportation is riding on a set of radial tires!” She’s not stupid, but she tends to say stupid things. Second, Asking Carson to be secular is like asking Ted Cruz to be a liberal. Besides, it’s blind hero worship. A brain surgeon has to be smart, but he’s no “rocket scientist,” nor is he a reasonable choice for president. Even Reagan came up through the ranks. He didn’t go directly from being Bedtime for Bonzo. It will be Rand Paul vs Hillary — and Rand already destroyed her in the Benghazi hearings…so Hitlery will lose by a landslide!